Can you believe it? It has been one year since Archippus Awakening was birthed at a prophetic event held at Bartley Christian Church on 3 August 2014. After that act of faith, I really didn’t know what to expect. All I knew was that there was work to be done and I was to be faithful to fulfil whatever the Lord would assign to me. And it wouldn’t be a leisurely stroll in the park either, for He said to me through Psalm 126:5, “Those who sow in tears shall reap in joy.” In other words, expect to work hard and to shed a few tears along the way. Looking back at our first year, I am amazed at what the Lord has done. Recount the following with me and join me in giving Him all the praise and glory! The Beginning of the End Special Seminar with Amir Tsarfati: Within a month of the birth, the Lord opened an opportunity for us to bring in Amir Tsarfati, a Messianic Jew known for his end time insights and teachings. 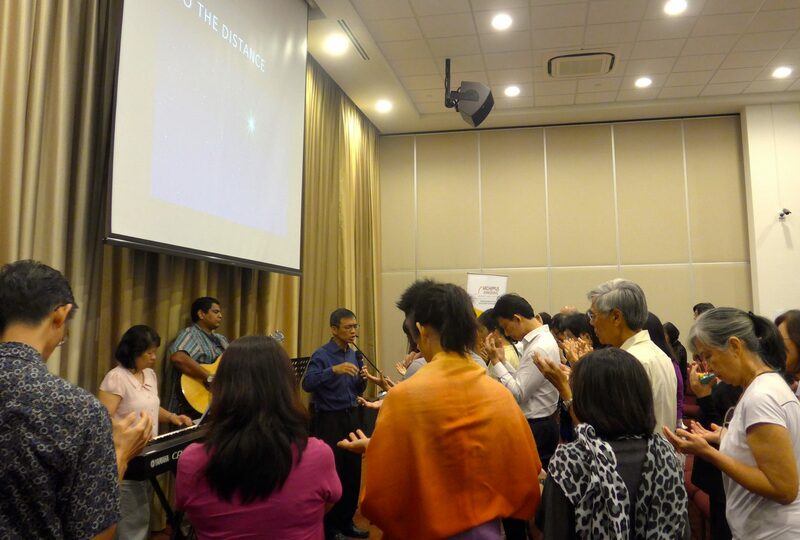 The one-day seminar was organised within six weeks and on 1 Oct 2014, the Good Gifts Auditorium was filled as more than 300 people attended Archippus Awakening’s very first Awakening Event. Retreats, Seminars and Camps: As the name of Archippus Awakening became more familiar, I received invitations to speak across various platforms. What was most encouraging was that all the themes facilitated the declaration of the message of Archippus Awakening. Some of these included Ang Mo Kio Methodist Church Cell Leaders’ Retreat, Shekinah AG Church Camp, Bartley Christian Church Zone Camp, Hakka Methodist Church Camp and GCWSCS Leadership Development Seminar. Beyond Singapore, in Philippines, Archippus Awakening was shared in Kidapawan City AG’s Prayer & Leadership Conference and also in Jesus Our Refuge Church in Tanauan Leyte. KINGDOM101: This expository journey through the gospel of Matthew started on 18 March 2015. Held at #11-11 CT Hub, attendance at these weekly teachings has averaged 50 participants from different churches. More than just a bible study, the objectives are to know the King, to embrace His kingdom and to receive our kingdom assignments. Although extremely challenging for me to prepare and deliver, it has also been very rewarding as positive feedback is received. This journey will continue for as long as it takes to complete Matthew or when the Lord directs me otherwise. Consider joining us on this exciting journey. Archippus Awakening Audio Channel on SoundCloud: To serve those who can’t make it for certain KINGDOM101 sessions, we set up this audio channel on the web. Anyone can listen to the teachings for free and then join or rejoin the expository journey as and when they are able to. Since offering this service, this channel has garnered more than 2,300 plays (as at the time of posting). We are thrilled that subscribers and followers (not limited to Singapore) are being blessed with teachings about the kingdom, and we pray that these would be duly awakened, aligned and assigned. SAY TO ARCHIPPUS: To me, the highest point must be the publication of Say To Archippus, a book about the heartbeat of Archippus Awakening. Within one month of the commissioning on 27 May 2015, the entire print run of 1,000 copies was sold out! We have ordered another batch so that more can read and learn about what it means to be an Archippus. If you have not got your own copy yet, you should! For more information, go to the BOOK: SAY TO ARCHIPPUS page. Looking ahead, I am excited and looking forward to our very own Awakening Event (AWE2015) in Batam over the weekend of 28-30 August 2015. When we announced this initiative, we didn’t know how many would sign up. We just closed the registration and there will be 50+ Archippuses coming together to fellowship and learn together! That said, I am not satisfied for it to be just another camp or encounter weekend. My prayer is that many of these Archippuses will be awakened, aligned and assigned for Jesus. Coming up in November, Archippus Awakening will be hosting a Worldview Conference. Plans are underway and details will be announced soon. Watch this space. As with everything we do, the objective is to serve the Body of Christ, to awaken the saints that they are made aware of the times we live in. There is no time for apathy anymore. Every Archippus must be aligned with the Lord, what He stands for and what He wants to do. Every Archippus must receive his or her assignment and move to fulfil it as enabled by the Holy Spirit. Finally, I have not forgotten about Archippus Academy. I am very clear that an awakening is only the first step and we must not stop or camp there. After that, there must be alignment that there can be assignment. This is where Archippus Academy comes in. To this end, I am praying about how Archippus Academy should be and what form it should take. Please pray for me too as I seek the Lord for the right elements and format, not to mention the people and resources required to launch this next initiative. God-willing, I would like to introduce something in 2016. Truly, what a year it has been! And yet, I know this is only the beginning. Time and again, when asked about the ministry, I find myself at a loss for words. The truth is, I don’t know what the next day would bring or what the next step would be! I am really taking it one day at a time, learning to trust and rest in Him. Thanks to one and all for your prayers and support. These faithful brothers and sisters have believed in the vision and mission of Archippus Awakening and have stood with me and served alongside one another through these early months of the ministry. I am so appreciative of each and every one of you! Let us continue to co-labour as we sow into the lives of other Archippuses to the glory of the Lord. Thank you, Lord, for your grace and faithfulness, leading and enabling us every step of the way. As we celebrate the first birthday of Archippus Awakening, send Your rain!!! I am 75, but one with Archippus Awakening. – henryLim. Jesus be blessed! Congratulations, Serene and Henson. Wow, time never waits. It has been a year already since Jesus called you out! Holy Spirit plans your program and leads you on. Our faithful God is pleased with your implicit trust and obedience! Not easy, Henson! Well done. Gallop on… Support you in prayers, Dincy. Thanks Dincy! Always appreciate your prayers and support 🙂 Blessings!